Editorials: W.P.A Lifts Sanctions on "Womens International Pool Championships"
Azbillards released a bombshell article last week by Jerry Forsyth siting the World Pool Associations anger with Dragon Promotions. The issue was that they were promoting the upcoming "Women's International Pool Championship" as a continuation of the former World 10 ball Championship held in the Philippines. As I received the same promotional package as everyone else I can say that W.P.A had a legitimate concern here. The result was the W.P.A stated that anyone attending this tournament will be stripped of all their ranking points and be forced to qualify for each event in 2015. To begin it is important to outline that the W.P.A is the governing body for pool, meaning they are the only ones who can sanction a World Championship. This sanctioning is not given out lightly and it shouldn't be because a World Championship should be held to a high standard. The main stipulation is having an adequate prize fund which Dragon Promotions was unable to obtain to gain the sanctioning. The W.P.A outlines their policy on this subject, for those interested, on their website. it is not fair that other World Championships are held to a higher standard. For example the World Men's 9 ball this year paid out $30,000 for first place with a prize pool of over $200,000. 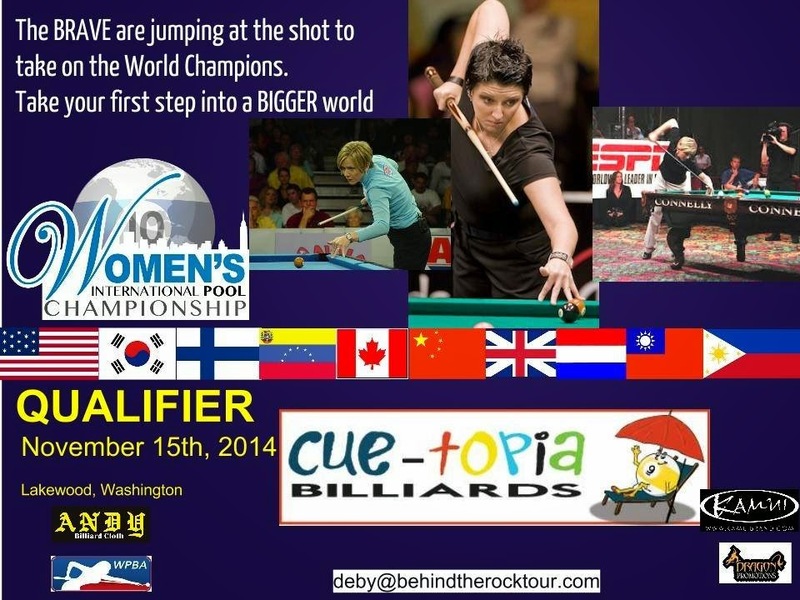 The Women's World 9 Ball Championships has a prize fund of $150,000 with no entry fee required. Also it was not clear whether or not it was a guaranteed prize fund or was it dependent on a full field. To add to the frustration for Anderson is that he has been in conversations for months with Dragon Promotions. He even strongly suggested them changing their name to an American Championships of sorts. However it was made clear in the follow up interview the next day with Dragon Promotions representative Cindy Lee, they were hell bent on advertising this as a World Championship. She might have been aloof about it, but it was made crystal clear when she constantly repeated the marketing advantages of calling it a World Championship. In all fairness the W.P.A could and should be criticized, however in this particular circumstance they are not at fault. Dragon Promotions had every opportunity to avoid the drama of last week, however they continued to snub the W.P.A. To me the real issue is obvious, Dragon Promotions does not respect the W.P.A and feel they do not have to obey their rules. An example of this was during the interview with Cindy Lee, Mike Howerton made it clear that the W.P.A was extending yet another olive branch. Anderson was willing to change his previous ruling as long as Dragon Promotions revamped their promotion of this tournament. Howerton outlined this and made it painfully obvious the solution. And when asked if they were willing to submit to the W.P.A for the sake of their own event Lee arrogantly replied,"anything could happen"
To me this demonstrates the very low regard they hold the W.P.A. Furthermore it took them until yesterday to have a public announcement stating that have met the requirements and now the sanctioning against them will be lifted. Considering that they were on the defensive with zero bargaining leverage and with players needing to make decisions on whether or not they participate, this was handled with little consideration. Let's not forget Dragon Promotions is not a non-profit, and this is not a charity event they are hosting. They wanted to falsely promote a World Championship not unlike what they do with the World 14.1, and make a bigger profit while showing disregard to the integrity of what a World Championship is. For a company with a public imagine who is dependent on the support of the players it would have been wiser to not blame the W.P.A. Rather to take responsibility for what they did and apologize for it and move on. However their choice was to promote a watered down World Championship for their own personal gain and defend this right up until the W.P.A had to make a ruling. Simply put, if you want the prestige of hosting a World Championship - meet the requirements.